Teen-aged me would be very disappointed in mid-life me. 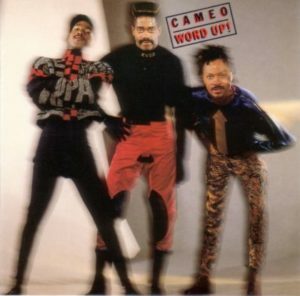 Cameo was all over the radio and MTV in the mid-80s with “Word Up”, and while the first few plays of the hit single were novel, the remaining billion over the course of its shelf life weren’t. That overexposure, of course, made me vow never to buy its namesake album. But what did I do at the Friends of the Library Book Sale some 30 years later? I picked it up for $1. What would compel me to turn back on my younger self’s resolve? The answer: “Candy”. “Candy” was the follow-up single to “Word Up”, and it too became a hit, albeit without the excessive airplay. It was an unlikely candidate for a single, possessing a strange bass line that starts simply but shifts rhythmically in unpredictable ways. The only hook in the song is the phrase, “It’s like candy”. The rest is a mishmash of an asymmetrical monotone melody and a punctuating guitar riff. Of the eight tracks on Word Up, it’s hands down the most complex. Over the years, the catchier “Word Up” could be heard piping into public places more often than “Candy”, and as such, “Candy” receded into distant memory … until it appeared on the pre-show playlist at a concert by the Revolution. When it came on, the oddness of “Candy” struck me, and I appreciated it on a level far more than I could as a teenager. A month after the concert, I found myself at the book sale with a copy of Word Up in my stack of purchases. It turns out the title track and “Candy” are the most anomalous tracks on Word Up. The remainder of the album’s seven tracks are journeyman funk tracks that would not have sounded out of place a decade earlier, save for all the analog synths. Word Up front loads its most remarkable tracks, then pulls back and becomes a different album altogether. If I bought it at the time, I wouldn’t have understood it, let alone appreciate it. And I certainly wouldn’t have enjoyed it the way I do now.